What is a square root of 25? How many square roots does 25 have? Definition: X is a square root of a if X² = a.
leads to the short‐hand way of writing both square roots as ± . Do the following square roots exist? What are the following square roots? is called a “radical sign” or a “root sign”. the expression under (or better said, inside) a radical expression. f (x) = is an example of a radical function. You need to memorize the first 21 numeric perfect squares. an integer exponent that is a multiple of 2.
usually results in an irrational number. integers and their decimal form neither repeats nor terminates. Definition: X is a cube root of a if X³ = a. You need to memorize the first 11 numeric perfect cubes. an integer exponent that is a multiple of 3. X is a fourth root of a if X4 = a.
X is a fifth root of a if X5 = a.
X is an nth root of a if Xn = a.
needed to return X to a by the previously state definitions. Positive number have 2 real roots. Zero is its own root. Negative numbers have 0 real roots. All numbers have exactly one real root. Notationally write the fourth roots of 81 and evaluate. Notationally write the fifth root of 243 and evaluate. raising an integer to a fourth power. raising an integer to a fifth power. absolute value symbols when simplifying. Absolute value symbols are never needed if a root has an odd index. Rewrite each expression in radical notation and simplify as possible. Use the properties of exponents to simplify each expression. Write your final answers with positive exponents. 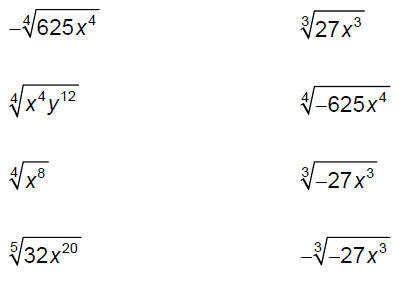 Use rational exponents with each to find a single simplified radical. To simplify radicals, apply the product and quotient rules in reverse. Emphasis: its all about perfect squares, cubes, etc. To add or subtract radicals, you must have like radicals. Like radicals have the same radicand and the same root index.